Gaming Heads has opened up pre-orders for two upcoming Sly Cooper Statues. These are based on his appearance in Sly Cooper 3: Among Thieves, originally for the PlayStation 2. The game was developed by Sucker Punch Productions, who you may know from the excellent game series Infamous. There will be two versions of the sly Cooper Statue available; a Classic Edition and a bronze Exclusive Edition. They are priced at $279.99 each, with a release set for the second quarter of 2019. Pre-order at the links below and see the photos by clicking the headline of the story. Gaming Heads is proud to present the Sly Cooper 3 Classic Edition Statue. Sly is a raccoon who is descended from a long line of master thieves and uses his skills, with the help of his long-time friends, to pull off heists from legit criminals. Standing approximately 13.5 inches tall, this beautifully designed ⅙ scale piece is carefully cast in polystone resin and hand-painted by artisans to depict Sly Cooper as found in Sly 3 Honor Among Thieves™. Each edition of the Sly Cooper 3 Statue can be posed with either his cane in front of him or over his shoulder. Each statue includes full-colour packaging, an individually hand-numbered base and an authenticity card to allow you to reserve the same number statue in future (or the same as your previous) entries in the PlayStation All Stars collection. The exclusive edition statue, only available at the Gaming Heads store and limited to 350 pieces worldwide has been painted in a brilliant bronze finish, making this statue a true gem in the collection of any Sly fan or master thief. 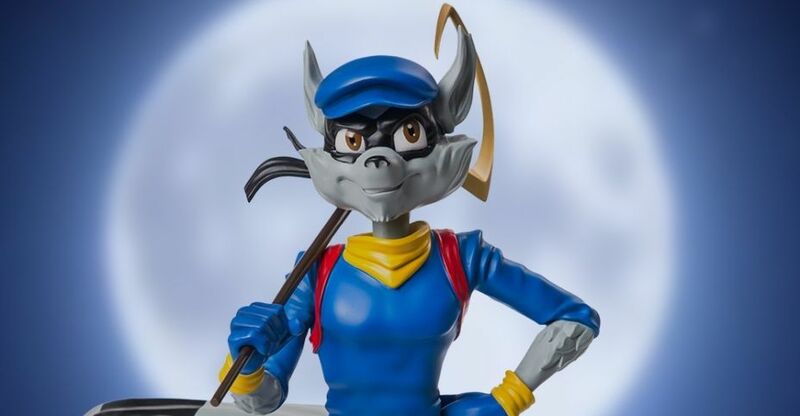 Gaming Heads have revealed product images for the next piece in their Playstation line of statues and collectibles, Sly Cooper! The wise cracking raccoon (no relation to Rocket) will be available in two flavors, regular and exclusive. The exclusive will be in a bronze finish. Check out the wonderfully done images and product hype after the break!